Nebraska Avenue is an urban commercial and residential arterial street that was reconstructed between 2007 and 2008 to improve safety for all users. The street was previously a dangerous corridor for pedestrians, bicyclists, and motorists with a relatively high motorized vehicle crash rate. 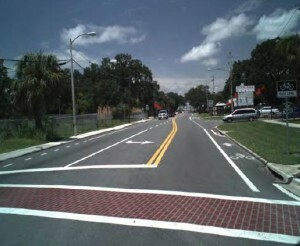 The Florida Department of Transportation (FDOT) redesigned 3.2 miles of Nebraska Avenue to make it more efficient for buses, better suited for people with disabilities, and safer for drivers, pedestrians, and cyclists, all with great success. The rightsizing was accomplished by converting one lane to bike lanes, transforming a travel lane into a combination of medians and left-hand turn bays, and upgrading other infrastructure. Road converted from 4 to 3 lanes, with the center lane a median and a two-way left turn lane for both directions at intersections. The lanes were also widened. Bike lanes added to increase bicyclists' safety. Bus bays added to improve bus loading and unloading while maintaining traffic movement. Midblock crossing added to allow pedestrians to safely cross between intersections. Traffic and pedestrian signals upgraded to optimize traffic and safety. ADA compliant sidewalk upgrades and needed roadway drainage improvements were constructed as part of the project. The frequency, rates, and severity of crashes on the corridor have decreased from above average to below average for its road type. 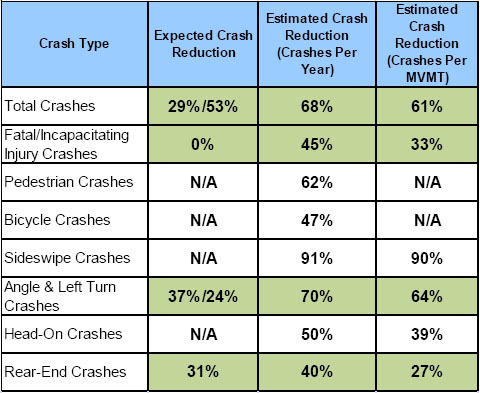 The current crash rate on Nebraska Avenue after the redesign is less than the average statewide crash rate for an urban 2-lane divided roadway, indicating the effectiveness of the set of improvements.The crash rate decreased from 8.5 to 3.3 crashes per million vehicle miles traveled (MVMT), when the state average was 4.47 and 3.58 crashes per MVMT for road types analogous to the before and after configurations.There was a 45% reduction in fatal/incapacitating crashes per year, which amounted to a 33% reduction per MMVT.The Sideswipe crash rate was reduced from 0.78 crashes per MMVT to 0.08 (a 90% reduction).The reduction in crashes has exceeded the expected results based on FHWA countermeasure data, which was used to predict the reduction in crashes based on published Federal Highway research (see image below). Bike crashes were reduced from 5.0 a year to 2.7 a year. Pedestrian crashes were reduced from 7.0 to 2.7 per year. Traffic volumes decreased after the redesign to 14,600 Annual Average Daily Vehicles from 17,900 before the redesign. Volumes on parallel roads indicate that this traffic was not diverted to those roads as the volumes remain approximately the same between the before and after periods. It is possible that some traffic was diverted to I-275, which was improved during this period. *Average annual before data was taken from 2004 to 2006 statistics, and after data drew from 2009 to 2011 statistics.The before and after report below notes that crashes may have declined further than the statistics above indicate because of aberrant reporting in one year of the after period.